If you've been reading here a long time, you'll already know this story. Back in 2010, The Woodland Park Cooperative Preschools were located atop Phinney Ridge, near our namesake zoo. Our outdoor space was little more than a small slab of asphalt. We annexed an area we called "the garden" by fencing in a patch of mud and installing a few raised beds, but nothing grew there because it was the only place we had for kids to dig. Several families told me that they'd almost not enrolled in our school because of our meager outdoor facilities; I'm sure many more families actually did walk away without saying a word. 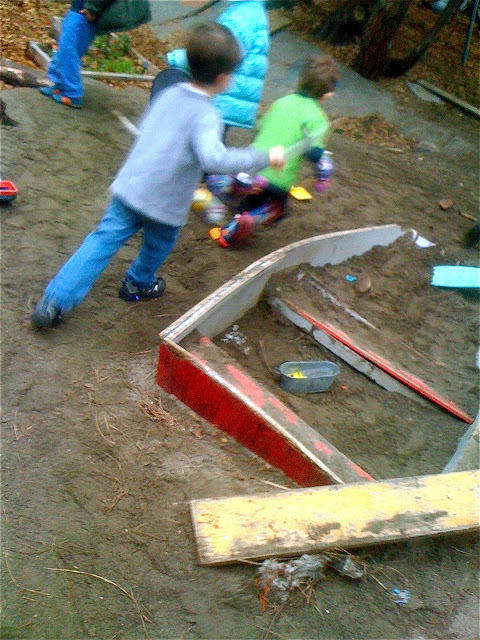 During the previous summer, however, inspired by my friend Jenny of Let the Children Play fame, I began to use the internet to explore more naturalistic play spaces, collecting ideas that I then brought to our parent community in the autumn of 2009, which lead to us building our first outdoor classroom, a transformation you can read about here. In the pictures you see a nice, tidy, newly created space. And in the beginning, as I was learning on the job how to be an outdoor educator, I tried to keep it that way, but that's not how a good educational environment works: it must evolve along with the children and their play. And as I began to let go, that small space did evolve, becoming looser, more adaptable, and yes, to a certain kind of adult eye, junkier. In fact, one parent, as she explained why she would not be returning with her daughter for the following year told me that part of the reason was that she couldn't stand the "junkyard chic." Although she intended it as a pejorative, I've since used that expression in my own internal dialogs about our outdoor spaces. In 2011, we moved to our current location at The Center of the Universe, where our community, having done it once on a smaller scale, created our current outdoor classroom, which like its predecessor has evolved a personality of its own, looking similar too, but quite different from the nice, tidy, newly created space it was 26 months ago. Periodically, I feel a ghost of my old control freakishness and hear in myself echoes of that dismissive parent as I look around and think in frustration, "damn this junkyard chic," fighting a strong urge to set everything to rights. But on most days I know I'm looking at a place where the children get to make it their own, a place in which we don't use things, but finish using them, a place where children invent, explore, discover, and play as children naturally do, without regard for chic, junkyard or otherwise. An Adventure Play Documentary from Erin Davis on Vimeo. "We haven't finished yet!" from Erin Davis on Vimeo. I Am Good At Doing Stuff from Erin Davis on Vimeo. I'm really looking forward to this film! Click on over to the Of Kith and Kin page to read more about Erin, her projects, The Land, and how you can support her work. And as an added incentive, Erin has included a terrific video from the 1970's about an early adventure playground in Chelsea, featuring one of the most articulate spokespeople for the idea I've ever heard.